Absorbed into: Smash! and Pow! Comments: The fourth of the five Odhams Press 'Power Comics' line to be launched, after Wham!, Smash! and Pow!, and before Terrific, Fantastic continued a trend of less and less UK-originated material being included in the comic in favour of the comparatively cheap and highly popular reprints of US Marvel comics. Though Marvel stories had been available to UK readers before, they were either from fairly random imported issues or reprints such as Alan Class, who skipped around without warning from title to title, making it impossible to actually follow the adventures of a given character or group. Thus, while only some of the Power Comics reprints were brand new to their British audience, they were definitely the first time UK fans could read everything in order and be assured of where to find the next installment. 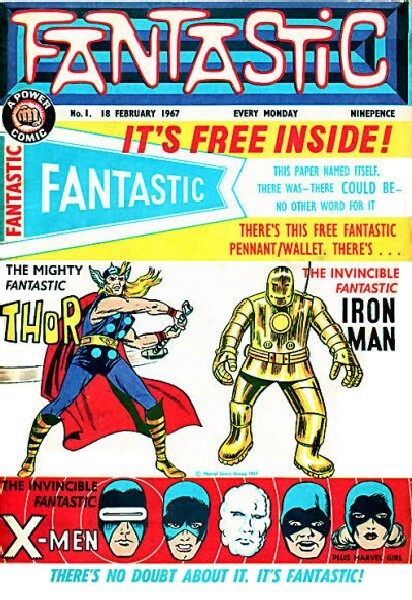 The first issue of Fantastic was cover dated 18th February 1967, and included Thor from Journey into Mystery; the X-Men from X-Men; Iron Man from Tales of Suspense; The Haunted House, a Steve Ditko one-off horror story from Tales of Suspense #42; and The Clock, a text story from Journey into Mystery #85. The only non-Marvel, original strip was Luis Bermejo's The Missing Link, the story of the discovery of very Hulk-like creature in a remote part of the world. After fifteen issues the Link was exposed to radiation, triggering his rapid evolution, and he became superhero Johnny Future, with a matching change to the strip's title. Thor and X-Men (bar a single skipped issue, #11) would both last the entire run of Fantastic, but Iron Man and Johnny Future both bowed out in #51, to make space for incoming strips from Terrific, which was being cancelled and merged into Fantastic. The retitled Fantastic and Terrific # 52 added Avengers (from The Avengers) and Doctor Strange (from Strange Tales), and was now an entirely reprint title. The new title would last through the remainder of the comic's run, though the latter part became increasingly small. The Avengers stayed a permanent fixture for the rest of Fantastic and Terrific's run, but Dr. Strange departed after #79. The Hulk, previously reprinted in Smash!, joined Fantastic and Terrific from #70 through #86. Three issues later Fantastic and Terrific cancelled with #89, cover dated 26th October 1968; it was absorbed into Smash! and Pow! (Smash! already having absorbed Pow! ), but only Thor made the transition to the new title. A notable regular feature in Fantastic were the Powerhouse Pin-Ups, new back-cover posters of various Marvel characters (and Johnny Future), credited to one Barry Smith; a year after Fantastic folded, he began working for Marvel US under his full name, Barry Windsor Smith.